Virtual keyboard is referred to a device or a technology that allows a user to enter characters. Virtual keyboard can be operated by touchscreen, mouse, and keyboard projected on the surface by laser. Virtual keyboard is a software component and are widely used by devices which have no physical keyboard such as personal digital assistance (PDA), touchscreen equipped smart phones and others. The virtual keyboard provides a handy substitute while working. The global virtual keyboard market is expected to expand at a robust compound annual growth rate over the forecast period i.e. 2017-2024. 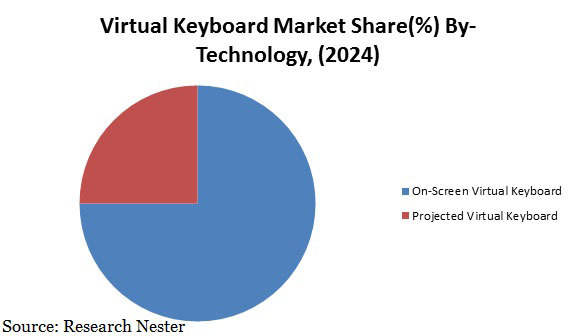 The factors driving the growth of virtual keyboard market include increasing adoption of innovative technology equipped with user friendly software and rising demand for touchscreen equipped devices. Further, on screen virtual keyboard by technology has the dominating segment in overall virtual keyboard segments and is expected to continue its dominance over the forecast period owing to growing use of on-screen virtual keyboard in automated teller machines, manufacturing machines, advanced automotive dashboards and others. Apart from this, telecom and IT sector by end user segment has been the leading segment owing to growing number of smart devices all across the globe. In terms of geography, North America was the leading market in virtual keyboards in terms of revenue in 2016. Further, the region is envisioned to continue its dominance over the forecast period owing to rising installation of virtual keyboards into manufacturing machines such as CNC machines. In North America region, U.S. is the dominating country on the account of growing investment in the research and development activities within defense, aerospace, healthcare industry and others. Growing adoption of touch screen mobile devices and portable computers is anticipated to be the dynamic factor behind the rapid growth of virtual keypads market. Further, rising development of smart infrastructure in developing and developed nations such as U.S., China, Japan, India and others is also one of the key factors propelling the growth of virtual keypads market. Moreover, advancement in electronic components, decreasing prices of electronic devices and rising personal disposable income of the population are envisioned to boost the demand for virtual keypad market. Furthermore, rising penetration of big players in technology sector and rising implementation of projected type virtual keypads in defense and government sector for safety purposes are projected to augment the growth of virtual keypad market over the forecast period. However, presence of other keypads such as mechanical keypads in market is anticipated to dampen the growth of virtual keypad market by the end of 2024.